Me & Mine: Mmmmmm, mmmmm, good! So Milo and I went to the Farmer's Market on Saturday (where I met up with Patricia, a friend from school who is now working as an accountant in Waynesville) and picked up potatoes, a cantaloupe, some herbs, an indoor (hopefully!) plant, and some blackberries. 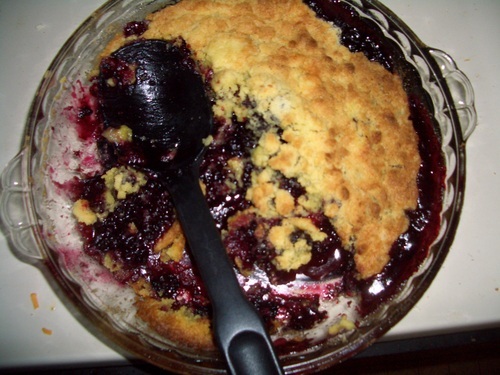 Yesterday I made this cobbler* - and it was definitely yummy! *Super easy: put the berries in a pie or cake pan; chop together a package of yellow cake mix and a stick of butter using a pastry blender and sprinkle over top of berries; bake at 350 deg for about 30 minutes.